Welcome to Adam Arnold – The Smarter CEO: contact information, profile and personal blog for the Smarter Group founder & CEO. The site is written by Adam Arnold himself so you’ll have to forgive the third person nature of this little introduction, About Adam Arnold and Contact Adam Arnold. It ends there and Adam Arnold’s Blog, entitled Encounters of an Entrepreneur, is written entirely in the first person! Adam Arnold is a twenty-something, husband and father living in Warwickshire, West Midlands. Considering Sir Richard Branson a hero and his achievements with the Virgin Group as simply magnificent, it should be no surprise that Adam Arnold has high aspirations with the Smarter Group. For Adam Arnold, branded entrepreneurship is very much the way forward. 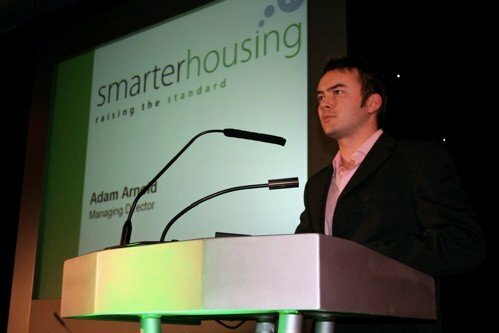 The adventure began in August 2005, when Adam Arnold founded Smarter Housing, a specialist provider of high quality student accommodation. Tenants would benefit from a fast, free and easy search, no letting fees and complimentary wireless broadband. As an additional perk, brandishing the Smarter Housing key-ring would grant the bearer numerous discounts at shops, bars and restaurants in the local area. Smarter Housing now manage over 300 student properties across Birmingham, Coventry (inc. Earlsdon and Royal Leamington Spa) and Nottingham and in recent months Adam Arnold has branched out into residential lettings and property sales. Further expansion into the provision of software for property managers and estate agents isn’t too far off. In 2008 Adam Arnold founded Smarter Nights, a multi-faceted company in the entertainment sector. In addition to organising student parties and charity events, the company offers student discounts and savings through the Smarter Card and online food, drink and DVD ordering through Delivery Dan, the handy delivery man! As a recognition of his early achievements, Adam Arnold is a Make Your Mark ambassador, a member of the Courvoisier Future 500 and has been quoted by former dragon Doug Richard in an article on business survival.